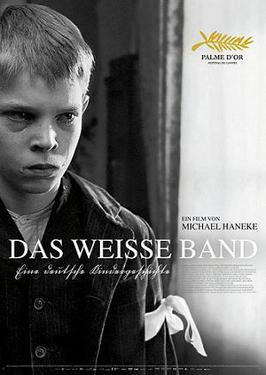 I recently went to see The White Ribbon, a film by the Austrian director, Michael Haneke. It is set in a small town in northern Germany, Eichwald, just before the outbreak of the First World War. The story, which is told in a series of vignettes, takes place over the course of one year. During this time, a number of violent crimes are committed. The local school teacher (Christian Friedel) gradually comes to the conclusion that a group of children are behind them. Life in Eichwald is suffused with brutality, mostly psychological, but sometimes physical. This brutality stems from two things: the feudal social relations in the town, and the severe Lutheranism preached by the pastor (Burghart Klaußner). Most of the people in the town are peasants, and half of them work for the local baron (Ulrich Tukur). The tensions this creates are illustrated by, among other things, the fact that the residents of the town are servile towards the baron, while the baron’s pampered son, Sigi, becomes a target of violence by the local children. (The town doctor (Rainer Bock) is the only character who doesn’t seem to fit into the class dynamics of this situation. Unlike the others, he seems to be motivated by pure selfishness. Perhaps this is Haneke’s view of the middle class.) It’s not hard to see that we’re meant to view the events of this film in the context of Germany’s history in the twentieth century. The White Ribbon is a haunting and disturbing film, all the more so because the issues are left unresolved at the end. It’s the type of movie that you keep thinking about for days after you see it. As I was watching this film, I couldn’t help thinking of the picture books of Wilhelm Busch, which were hugely popular in Second Empire Germany. These often told stories of children who play cruel tricks. The most famous of these is Max und Moritz, which inspired the first American comic strip, The Katzenjammer Kids. The book is funny, but at the same time there is something kind of awful about it, because of the sheer nastiness of the children’s pranks. In one episode, they put gunpowder in a man’s pipe. When he smokes it, it explodes, blackening his face and burning all his hair away. (Needless to say, Busch graphically illustrates this.) Elsewhere, we see Max and Moritz laughing and cheering while a man falls into a rushing river and nearly drowns. It could be argued that that Max and Moritz are the literary forebears of Bart Simpson. I would be interested to know if Matt Groening has read Busch’s books. The reason I bring all this up is that I suspect that Haneke may have had Busch in the back of his mind when he was writing the script. However, there is nothing humorous about the children’s crimes in this film. I must say, though, this movie might have benefited from a bit of comedy. The scenes in which the schoolteacher awkwardly tries to woo a painfully shy girl, Eva (Leonie Benesch), are vaguely humorous and provide a much needed respite from the brutality in much of the rest of this film. As I said before, though, The White Ribbon is worth seeing. It is one of the more memorable movies that I have watched recently. This entry was posted on March 16, 2010 at 7:56 am and is filed under Cinema, Germany, Literature, Popular Culture. You can follow any responses to this entry through the RSS 2.0 feed. You can leave a response, or trackback from your own site.